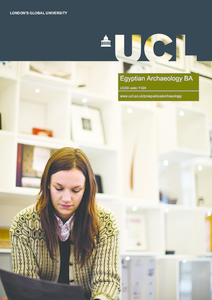 The Egyptian Archaeology BA at UCL is the only UK degree to combine the theory and practice of archaeology with the study of Egyptian sites. This specialist degree will prepare you for a wide range of careers both within Egyptian archaeology and heritage studies, and beyond. Most of the degree is structured around a combination of core and optional modules. In your first year, you will receive a solid grounding in both the practical and theoretical methods in archaeology, as well as an introduction to major issues in Egyptian archaeology and writing. The second and third years provide a more advanced understanding of Egyptian archaeology and allow you to develop your own specialised interests by choosing optional modules in particular subject areas. In the third year you are given the chance to reflect critically on your fieldwork experience during the degree through a fieldwork portfolio, and write a 10,000-word dissertation on a detailed subject that you will choose with the help of a supervisor. You will select 1.0 credit of optional modules in Archaeology. You will select 1.5 credits of optional modules in Archaeology and a further 0.5 credits in either Archaeology or a related subject. Coursework, typically 1,500-2,500-word essays, is used to assess most modules. Most compulsory modules and some optional modules involve an examination element too. The completion of 70 days' fieldwork is a requirement for all archaeology students. Once an offer has been made applicants, unless living overseas, are invited to attend a Post Offer Open Day where they will meet staff and students and will be able to see all of the facilities on site at the UCL Institute of Archaeology and UCL.